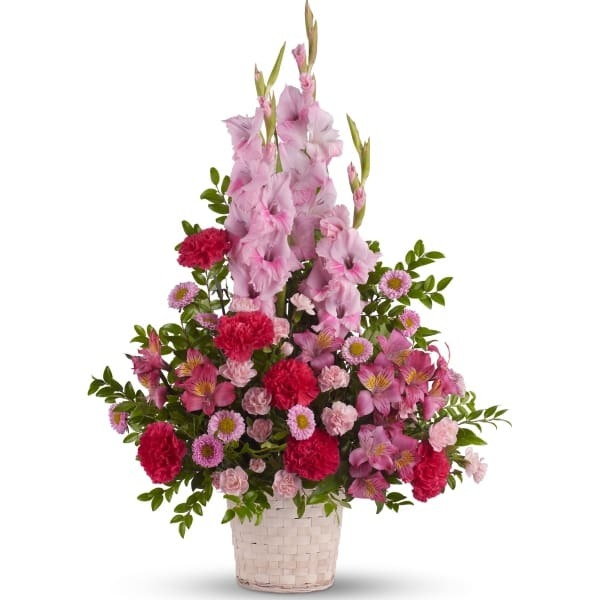 • A mix of fresh pink blossoms like gladioli, alstroemeria, carnations and more are lovingly arranged in a white basket. 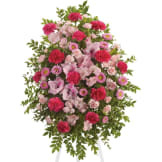 • Arrangement measures approximately 23" W X 33" H.
Flowers will be received by a Lasting Tributes' staff. The arrangement was beautiful. 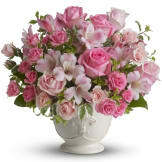 The freshness of the flowers was outstanding. I would not hesitate to order from the Sympathy Store again. The convenience cannot be beat. Since this Bouquet is for a man I suggest that white flowers are more appropriate than the pink ones show in the picture. All of our flowers are designed and delivered by hand from a local florist in in Annapolis.